Bandoni, R.J.. "Mushroom and Puffball". The Canadian Encyclopedia, 04 March 2015, Historica Canada. https://www.thecanadianencyclopedia.ca/en/article/mushroom-and-puffball. Accessed 26 April 2019. Mushroom and Puffball, fleshy, spore-bearing fruitbodies produced by many club fungi (Basidiomycetes) and a few sac fungi (Ascomycetes). Chanterelles (photo by Tim Fitzharris). Fly agaric mushroom, showing its distinctive red cap (photo by Tim Fitzharris). Mushroom and Puffball, fleshy, spore-bearing fruitbodies produced by many club fungi (Basidiomycetes) and a few sac fungi (Ascomycetes). Such fungi may be saprophytes, living on and causing decay of organic matter; symbionts, living in association with tree roots to their mutual advantage; plant parasites, carnivors, poisoning and digesting microscopic worms; or soil-inhabiting species, where mycelium (a mass of filaments forming the vegetative body of the fungus are lichenized) grows indefinitely. Fruitbodies are produced when conditions are favourable. Rings of fruitbodies (eg, fairy rings) mark the location of buried mycelium. Rings expand annually and ages can be estimated from annual diameter increase. Some rings are over 500 years old. Mushroom species in Canada exceed 3000; of these many also occur on other continents. Mycologists (biologists studying fungi) do not distinguish mushrooms from toadstools, although the latter term is popularly used for poisonous types. Related species may differ markedly in edibility, and no simple tests exist for identifying edible types. Identifying features are macroscopic or microscopic. For specialists microscopic features are most significant, eg, shape of spore-bearing cells, size and other features of spores and microscopic fruitbody structure. Macroscopic characteristics include fruitbody shape and colour, presence or absence of ring (annulus) and cup (volva), form of spore-producing layer (hymenium) and spore-print colour. In the button stage, the cap and stalk of a mushroom are joined by a membrane (veil) that ruptures as growth occurs, preparatory to spore dispersal. As the destroying angel (common in eastern Canada) develops, remnants of 2 membranous veils are left, 1 as a ring on the stalk and 1 as a cup at the stalk base. Fly agaric or fly amanita has a bright red cap with warts (also veil remnants) and a ring; its cup consists of irregular ridges around the swollen stalk base. Mushrooms may have only the ring or only the cup; many have neither. Gill fungi such as market mushrooms and amanitas produce spore-bearing cells on surfaces of structures called lamellae. Pore fungi (eg, boletes) have pores (tubules) instead of lamellae. The hymenium of hedgehog mushrooms is borne on teeth; that of crested coral mushroom covers branch surfaces. The morels and potentially poisonous false morels produce spores in sacs (asci) on the outer cap surface. All of these have exposed spore-bearing surfaces, but puffball spores are enclosed in the fruitbody. Gemmed puffballs become dry at maturity, a pore develops at the top and the fruitbody functions as a bellows when struck (eg, by water drops). 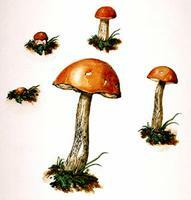 Spore masses, shown in spore-prints, are white in amanitas and the fairy ring mushroom; chocolate brown in market mushrooms; yellowish, pinkish, rusty brown or black in other species. 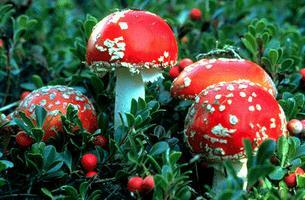 Mushroom poisonings are caused by several toxins. Amanitas and some galerinas and lepiotas produce heat-stable amatoxins and phallotoxins, which induce symptoms felt only after 4-48 hours. Also potentially fatal, with a delay of up to 2 weeks before symptoms appear, are the orellanins produced by some Cortinarii. False morels produce a potent toxin (monomethylhydrazine) which is lost if the mushrooms are thoroughly cooked. 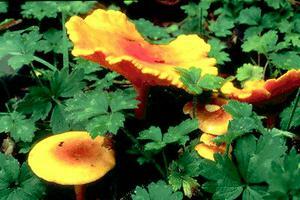 Muscarine, present in small quantities in fly amanita, is abundant in some inocybes and clitocybes, poisoning by which may cause death; appropriate treatment neutralizes poison. Mild poisoning (diarrhea, etc) occurs with ingestion of numerous other mushrooms. Some mushrooms, notably psilocybes, contain the legally restricted drug psilocybin, which is hallucinogenic. Commercial exploitation of wild mushrooms is increasing in Canada and forms the basis of a multimillion dollar cottage industry. Pine mushrooms (North American matsutake) and chanterelles are exported. See also Mushroom cultivation. Helene M.E. Schalkwijk-Barendsen, Mushrooms of Western Canada (1991); R. Pomerlean, Flore des champignons au Québec (1980).